Yesterday was a walkout of over 3000 schools throughout the country as a way to show deference to the students murdered by a crazed gunman is Parkland Florida. This is a major story as it should be, but the reasons for the walkout mutated to nothing more than another reason to bash the NRA and innocent gun owners throughout the country. The main premise which was covered almost 24/7 by most of the progressive mainstream media focused on the major issues that those in charge see them since the shooting. Guns are bad, assault weapons which are fluid in their definition at best, and the NRA are boogeymen who must be eradicated in any way possible. Lets talk of those who are really in charge of this whole show of concern and outrage. The Women’s March, Media Matters and ultimately George Soros have combined to organize all this. The teachers union comprised of forced dues-paying members and progressives who use the opportunity to instruct these children in the Marxist traditions that education uses as a base today. The political indoctrination and propaganda that is being forced on these children today is the same as it has been for the college students that we all have seen in the streets burning and looting because they care more than you do, are more educated than you are and in every way are morally superior to those outside of the bubble they have placed themselves inside. Being a social justice warrior sound like a high level, morally superior person, someone who can walk on water and dispense truth like Tide Pods to any who will listen, almost a God-like creature who is to lead the ignorant masses to the light. 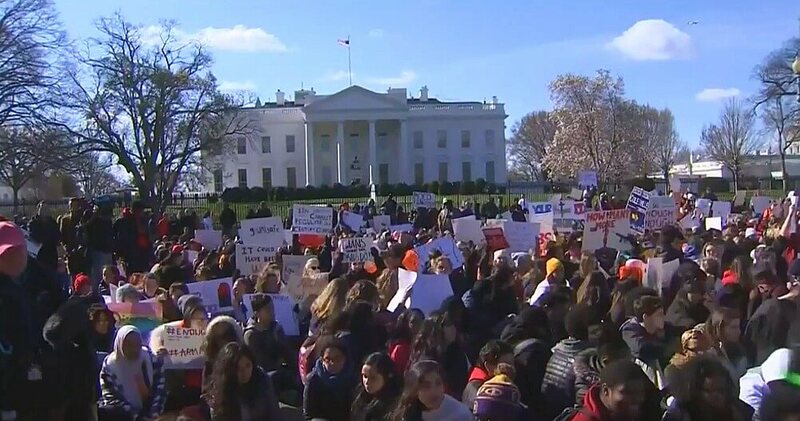 These protests are built on the premise “that a child should lead them” faintly historical, faintly biblical but of a pattern unseen in the roots of religion. These are the sycophants to the progressive thought that the DNC chair gathers together to shout in his fake outrage that the conservatives are morally bankrupt. That the rich donors that run the RNC are rich donors who do not care about the middle class. The DNC and progressives are using the time-worn playbook of demonstrations, shouting down or not even allowing the opposition to speak. To demonize your opponent and use every other facet of the Alinsky playbook in an attempt vilify your opponent and silence them. Now, this same playbook is being used to demonize the NRA and the millions of supporters who believe in the 2nd Amendment and the right to self-defense and defense of the country. The question then becomes, how much will it take to destroy the NRA and the millions who support it? How can we shame them to make them slink away and dissolve one of the oldest civil rights groups in America? I know! We can call them murderers and racists. Oh, wait, the NRA was formed to protect the blacks from the Democrat based KKK. Ok. Well, maybe we can say that don’t care about dying children? No, they spend a good amount of the dues they receive to teach gun safety to those same children. OK, well then, how about the fact that they have sold assault weapons to poor innocent children who then went out and shoot up people. The NRA has never sold a gun to anyone. The NRA exists to protect our 2nd Amendment right and nothing more. The NRA has gained over 500,000 members since the Parkland shootings, perhaps its largest one month in history. David Hogg and his fellow whiners have even surpassed Obama as the best gun salesman in history. Big corporations, afraid of being vilified as well have been quick to distance themselves from the NRA. Just take a look at companies like Delta, Hertz, and others and what this has done to the bottom line. Delta airlines lost a $40 million tax credit in Georgia for 13 people who had used the NRA discount. How has this virtue signaling from the CEOs of these progressive companies helped anyone including their stockholders? Many of those on the fence have responded with their money and not only joined the NRA but purchased weapons for protection. The town-hall that was a show trial on CNN, the “discussion” being undertaken by Harvard and at countless smaller venues across the US is not trying to find a solution but instead are doing nothing more than trying to indoctrinate the listeners in the ways that students have been in our schools. The media will try to stoke fear in the American people about anything gun related. The AR15 now being lauded and the massacre gun of choice has a history of sales of over 60 years and has been used in 6 of 96 mass shootings. But let’s be honest. To the gun novice it looks scary so let’s push for all it’s worth to get rid of it. The principle antagonist in all this is one David Hogg. He has progressed from a “victim” of the Parkland shooting to the mouthpiece of CNN and other mainstream media to the voice of a generation that is going to fix all the problems that the adults have caused in this world. He is the picture of smug self-satisfaction while looking like he has constant constipation. The anger that he attempts to show on his face belies that advantages the mainstream media has afforded to him to say anything he wants without being questioned. Because he uses the same left wing talking points as the progressive politicians and the MSM uses he continues on loudly voicing his false opinions and talking points that have been used for the past 50 years. Rattling off the talking points of leftists isn’t difficult. I find it hard to believe that this paragon of righteousness would have ever spewed what he has about Betsy DeVos without coaching from the media and progressive socialists who bought the right to tell him what to say. Anyone who disagrees with him is called racist, or even worse. Does anyone really think the David Hogg has more information that someone like Alex Jones who he was willing to debate after calling Jones gutter trash until his handlers told him it wasn’t a good idea and he canceled the debate? Typical progressive socialist playbook. Insult those who disagree with you and then run away when confronted. This paragon of virtue signaling that the mainstream media have all told us to listen to claims that the Center for Disease Control was prohibited from research into the area of guns by the Dickey amendment, although his messiah, President Obama lifted that ban in 2013. The issue of dedicated funding was the sticking point and the argument for dedicated funding is a valid one but pontificating the prohibition was in place is a lie. His talking points must have been written by someone not up on the facts. Tham mainstream media will have to do better in their fact-checking. And all the while, the talking heads in the progressive media sagely nod their heads as if listening to Moses. Of course, the NRA is the culprit. Lying again, Hogg says the NRA terrorizes children. Money sent teaching children gun safety is not terrorism and is done on a voluntary basis. What does this self-centered narcissistic angry little boy know about terrorism or even what the NRA does? David Hogg may have been a victim a one time, although there are reports that he wasn’t even in the same building as where the shooting occurred. Has anyone asked him that? Or does he only appear on networks that give him talking point and would never question him as to the validity of what he claims? David Hogg has moved on from being a “victim” to being a bully who the mainstream media have turned into the media darling from gun control. He persists in using slander and ridicule on those who disagree with him to push forward an agenda that is hoped to lead to the confiscation of guns. He and his social media trolls will do everything they can to influence legislation that he feels is needed. The question I have asked before and others continually ask, Who the hell is David Hogg to demand anything? He demands the Rick Scott, Governor of Florida be held responsible for the Parkland shooting and ignores the bureaucrats from local to federal who lit the shooter slips through the cracks. Gov. Scoot did not appoint the Broward Sherriff’s Office which failed so miserably in their job, nor did he assign the FBI agents who ignored the warnings. But he is the closest Republican to the center of the shooting so he must be blamed. Hogg is nothing more than a self-serving political hack and will surely move up in the progressive socialist elites who continue to denigrate our citizens without any thought of protecting our rights or our safety. A tragedy of any form should not be used to push a political agenda. It was the progressives who swore they would never let a crisis go to waste. It appears David Hogg has taken the bait and is hooked on lies and deceit to formulate an agenda for himself and the progressive socialists who spoon feed Hogg the talking points to move the agenda forward.